When I first joined the humanitarian sector in 2013, I never thought it would become my passion. 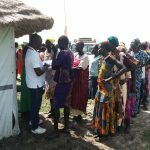 My journey in this sector started when I volunteered with a local NGO, as a college student, to help people who were displaced during the 2013 crisis in South Sudan. I spent nine months in an area called Raja doing nutrition assessments and when I finished, I had my heart set on being a humanitarian worker. I went back to school to complete my studies and later got a job with a local NGO as a Programme Officer for Education and Child Protection. This officially marked my entry into the humanitarian world. When I am doing my job, I delight in the knowledge that the people have the right to determine what they need. This is possible because as an organisation, we believe in listening to the voices of those in need and giving them an opportunity to determine the kind of assistance they require. It also helps to address real needs and not what someone else assumes they might be. In 2017, I joined CARE where I have had the privilege of helping the people of South Sudan through my contribution as a Monitoring and Evaluation Officer. I also work in peace building and social cohesion projects. I specifically like this work because it brings people together whose relationships have been scarred by years of mutual mistrust because of the conflict in my country. It always brings joy when we bring two conflicting parties together for peace discussions. This, for me, is the first step towards a long-lasting peace. Despite being passionate about my work, sometimes it is so challenging to work in a context such as South Sudan. Now and again, we are hindered to effectively deliver humanitarian assistance. Of note are the many checkpoints and roadblocks that, in some cases, deny us access to help people in need. We also have the highest level of insecurity in the field. As humanitarian workers, we always strive for impartiality but we are sometimes targeted also targeted in situations of armed conflict. I have friends in the sector who have been caught in a crossfire and some have lost their lives. This is the reality I have to live with every day as an aid worker in South Sudan. Every day I wake up ready to help my people, but in the back of my mind, I also have this niggling fear of being attacked whilst doing my work. Most of the areas where we work become inaccessible in the rainy season because of poor road networks. This is one of the biggest challenges because the need is greater during this time as we try to reach farmers with farm implements such as tools and seeds. Sometimes we get stuck on the road for days. But this doesn’t discourage us. We keep on pushing. I am always happy when we finally reach the farmers and see the joy on their faces when we give them seeds. In my country, seeds are a symbol of hope. I thrive on hope. It is what keeps me going as an aid worker. The hope that my work will help change things for the better. However, after all, has been said and done, I want to see South Sudan where every child goes to school without fear. I want to see South Sudan where we don’t hear gun sounds anymore. I want to see a South Sudan where a woman goes to fetch for firewood without fear of being assaulted. I want to see a South Sudan where no one goes to sleep on an empty stomach. I want to see South Sudan where people sleep in their houses without fear of being killed. That’s the South Sudan I want as a citizen and a humanitarian worker.